2015-16 SEASON: Played in all 82 games (22 starts) with Toronto, averaging 5.5 ppg., a career-high 8.0 rpg. and a team-high 1.62 blkpg. in 22.0 minpg., while shooting .542 (156-288) from the floor…Was the only member of the Raptors to appear in all 82 games…Ranked 13th in the NBA in blocked shots…As a starter, averaged 7.2 ppg., 12.2 rpg. and 2.00 blkpg. in 29.8 minpg….Led (or tied) the team in rebounding 32 times…Scored in double figures 17 times, including a career-high 16 points on Mar. 17 @ Indiana…In the same game, ripped down a career-high and franchise-record 25 rebounds…Pulled down 10+ rebounds 23 times, 20+ rebounds twice and had nine double-doubles…Had 12+ rebounds in six consecutive games from Dec. 14-26…Recorded a then career-high 20 rebounds on Dec. 22 vs. Dallas…Had at least one blocked shot 65 times and two-or-more blocks 35 times, including a career-high-tying seven blocks on Dec. 17 @ Charlotte…Became the first Raptor since Dec. 16-19, 2001 to record at least four blocks in back-to-back games…Also appeared in all 20 playoff games (10 starts), averaging 6.2 ppg., 9.4 rpg. and a team-high 1.35 blkpg. in 25.3 minpg., while shooting .580 (40-69) from the floor, helping Toronto reach the Eastern Conference Finals for the first time in franchise history…Started in all six games during the Eastern Conference Finals against Cleveland, averaging 6.3 ppg., 10.3 rpg. and 1.83 blkpg. in 31.3 minpg….Set a franchise playoff-record with 26 rebounds on May 21 in Game #3 against the Cavaliers. PROFESSIONAL CAREER: Appeared in 366 career NBA regular season games (158 starts) with Charlotte and Toronto, averaging 4.6 ppg., 6.5 rpg. and 1.57 blkpg. in 21.2 minpg., while shooting .507 (630-1,242) from the floor…Had 10+ rebounds in 74 career games and 28 career double-doubles…Also played in 23 career playoff outings (11 starts), averaging 5.7 ppg., 8.6 rpg. and 1.26 blkpg. in 24.1 minpg. 2014-15: Played in 64 games (21 starts) with Charlotte, averaging 4.8 ppg., 6.4 rpg. and 1.55 blkpg. in 19.4 minpg., while shooting .543 (101-186) from the floor…As a starter, averaged 6.8 ppg. and 8.4 rpg. in 26.9 minpg.…Ranked 17th in the NBA in blocked shots…Scored in double figures eight times…Pulled down 10+ rebounds 14 times and recorded six double-doubles…Had at least one blocked shot 50 times. 2013-14: Appeared in 77 games (nine starts) with Charlotte, averaging 2.9 ppg., 4.8 rpg. and 1.12 blkpg. in 13.9 minpg., while shooting .611 (88-144) from the floor…As a starter, averaged 4.7 ppg. and 8.2 rpg. in 27.0 minpg.…Ranked 24th in the NBA in blocked shots…Led (or tied) the team in rebounding nine times…Scored in double figures twice…Also played in three postseason outings (one start), averaging 2.7 ppg. and 3.4 rpg. in 16.0 minpg. 2012-13: Played in 80 games (65 starts) with Charlotte, averaging 4.8 ppg., 7.3 rpg. and 1.79 blkpg. in 27.3 minpg.…Tied for ninth in the NBA in blocked shots and 30th in rebounding…As a starter, averaged 5.0 ppg., 7.7 rpg. in 28.9 minpg….Led (or tied) the team in rebounding 33 times…Scored in double figures 11 times and had 10+ rebounds 19 times…Had seven double-doubles…Set a franchise record with 44 games with two-or-more blocks, including a career-high-tying seven blocked shots on Jan. 21 vs. Houston…Played a career-high 43 minutes on Apr. 15 vs. New York. 2011-12: Appeared in 63 games (41 starts) with Charlotte during his rookie campaign, averaging 5.2 ppg., a team-high 5.8 rpg. and a team-best and career-high 1.83 blkpg. in 23.1 minpg….Ranked eighth in the NBA in blocked shots…Ranked among all NBA rookies in blocked shots (first), rebounding (third) and field goal percentage (sixth, .464)…As a starter, averaged 6.4 ppg. and 7.3 rpg. in 28.7 minpg….Led (or tied) the team in rebounding 20 times…Scored in double figures ten times and had 10+ rebounds 11 times…Recorded five double-doubles…Blocked at least two shots 31 times…Ranked fifth in the NBA with ten games of at least four blocked shots and joined Serge Ibaka as the only two players in the league with at least three games of six-or-more rejections…Had his first career double figure scoring game, double figure rebounding game and double-double with 11 points and 10 rebounds on Jan. 17 @ Orlando. CAREER TRANSACTIONS: Selected by Sacramento in the first round (seventh overall) of the 2011 NBA Draft…Draft rights traded from Sacramento to Charlotte as part of a three-team trade; Charlotte also acquired Corey Maggette; Sacramento acquired Jimmer Fredette and John Salmons; Milwaukee acquired Tobias Harris, Stephen Jackson, Shaun Livingston and Beno Udrih (Jun. 23, 2011)…Signed as a free agent by Toronto (Jul. 18, 2015)…Signed as a free agent by Orlando (Jul. 7, 2016). INTERNATIONAL CAREER: Played in Spain for two seasons (2009-11) with C.B. Illescas of the LEB Silver League and Baloncesto Fuenlabrada of the ACB League…2010-11: Played in 14 games with C.B. Illescas, averaging 9.0 ppg., 6.4 rpg. and 1.9 blkpg. in 21.9 minpg., while shooting .588 (50-85) from the floor...Then appeared in 14 games with Baloncesto Fuenlabrada, averaging 6.4 ppg., 5.1 rpg. and a league-best 2.3 blkpg. in 17.1 minpg., while shooting .552 (32-58) from the floor…2009-10: Appeared in 19 games with Fuenlabrada-Getafe Madrid in the EBA, averaging 9.4 ppg., 6.8 rpg. and 2.1 blkpg. in 23.8 minpg., while shooting .579 (70-121) from the floor, before moving to C.B. Illescas…In 31 games with C.B. Illescas, averaged 5.6 ppg., 4.9 rpg. and 1.5 blkpg. in 20.0 minpg., while shooting .581 (79-136) from the floor…Participated in the Nike Hoop Summit in 2011…Tallied 12 points, 11 rebounds and a Hoop Summit-record 10 blocked shots, to record the only triple-double in event history…Also played in Yemen in 2008-09. 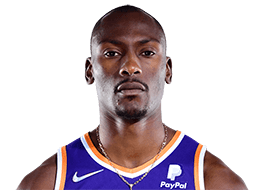 ONE-ON-ONE: Full name is Bismack Biyombo Sumba…Name is pronounced bis-MOCK bee-OM-bo…Born in Lubumbashi, Congo…Son of Ngoie and Biyombo Francois…Has three brothers (Billy, Biska and Bikim) and three sisters (Bimeline, Bikelene and Bimela)…Speaks five languages: English, Spanish and French, along with Swahili and Lingala, two of the recognized national languages of the Democratic Republic of Congo…Enjoys reading in his spare time…You can follow him on Twitter: @bismackbiyombo0.